L.A. Conservancy, JA community at odds over Parker Center’s fate. 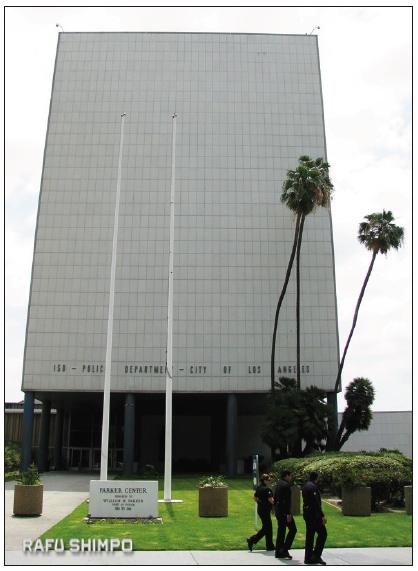 When Parker Center was constructed in 1954 to house the Los Angeles Police Department headquarters, many considered architect Welton Becket’s modular, glass-enclosed design a fitting complement to Los Angeles’ sprawling Civic Center. Today, the 62-year-old building at First and Los Angeles streets is in disrepair and, according to a Bureau of Engineering (BOE) report, is uninhabitable. On Jan. 10, Japanese American community representatives appeared before the City Council’s Entertainment and Facilities Committee to support a plan that would demolish Parker Center and replace it with a 750,000-square-foot complex, creating office space, parking, and linkages to Little Tokyo that could also encompass El Pueblo and Chinatown. Community spokespersons also reminded the committee, composed of Councilmembers Mitch O’Farrell, Joe Buscaino, and Paul Krekorian, that the site was once a vital part of Little Tokyo. It is where the original Nishi Hongwanji Buddhist Temple and Rafu Shimpo offices were established in the early 1900s and where young Nisei played sports, including sumo wrestling, in a nearby open lot. At the outbreak of World War II, the Buddhist ministers, newspaper staff, and others who worked in the area were forced to leave for wartime camps in 1942. By 1950, Japanese Americans had resettled and re-established the area when city officials suddenly exercised eminent domain to make way for Parker Center construction. An image from the 1950s shows the corner of First and San Pedro streets. 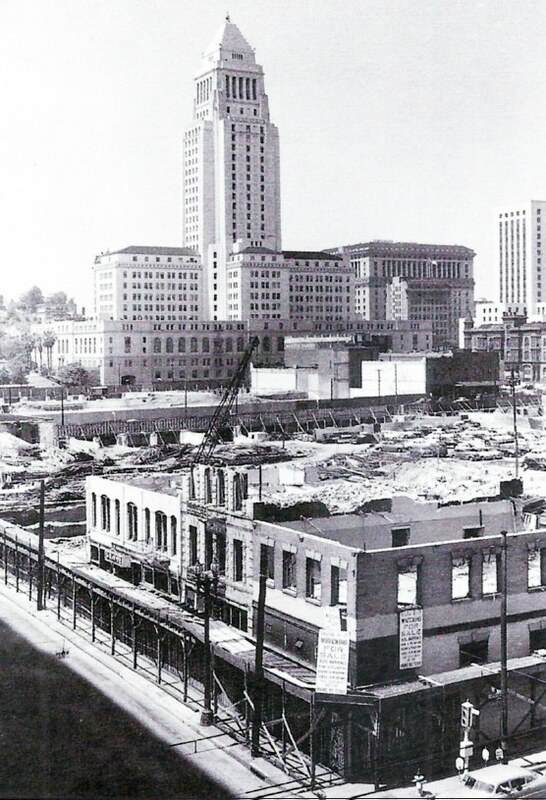 Japanese American businesses, residents and organizations, including the Olympic Hotel and The Rafu Shimpo, were displaced to make way for the development of what was then known as the Police Facilities Building. The building was later renamed for former Chief William Parker. “This represents what the city did to our community. We were pushed around. (City officials) didn’t give a damn about that 60 years ago,” stressed Chris Komai, Little Tokyo Community Council (LTCC) board chair and representative of the family that owns The Rafu Shimpo. According to Yukio Kawaratani, a former Community Redevelopment Agency planner, the Community Design Overlay approved by the City Council in August 2013 officially recognizes the site as part of Little Tokyo. Rehabilitation and/or restoration, advocated by members of the Los Angeles Conservancy, a nonprofit historical preservation group seeking to preserve Parker Center, would cost an estimated $621 million, according to the BOE study. In contrast, demolition of the existing structure and new construction would cost $514 million — a savings of $107 million, as outlined in the BOE study. L.A. Conservancy members dispute the BOE figure, saying instead that rehabilitating Parker Center would save the city $50 million. A report by City News Service quoted an email in which the Conservancy accused the BOE of “putting their thumb on the scale” of the preservation options. “We believe that there is a big enough discrepancy of $50 million that the city should take a breath and bring in an independent cost estimator that has some preservation experience and really look at whether there is a possibility of finding a real win-win solution,” Linda Dishman, L.A. Conservancy president and CEO, told the committee. The Conservancy points out that Becket also designed the iconic Capitol Records building, Music Center, and Cinerama Dome. Additional support for creating a new structure came from John Howland, representing the Central City Association, and Miguel Vargas, executive director of the Arts District Business Improvement District, who supported the LTCC and LTSC positions. The building was originally known as the Police Facilities Building. In 1969, it was named after former Chief William H. Parker, who served in the LAPD from 1950 until his death in 1966. Allegations of racial discrimination by police and abuse against the black community are part of Parker’s legacy, which included the 1965 Watts Riots. After hearing comments from about 20 people, committee chair O’Farrell suggested waiting until the Planning and Land Use Committee has a chance to hear a Cultural Heritage Commission recommendation regarding Parker Center’s historic-cultural status, which is expected by mid-February. CNS reports that the commission made the recommendation in September, which was the second time it had done so. In January 2015, the commission made the same recommendation, but the Planning and Land Use Committee missed a deadline to consider the nomination. Even if the committee and then the full City Council were to adopt the recommendation, the council could still approve demolishing the building if no viable option for preservation is found. Under the demolition plan, the new site would include a memorial to Parker Center featuring artwork and relics from the building.